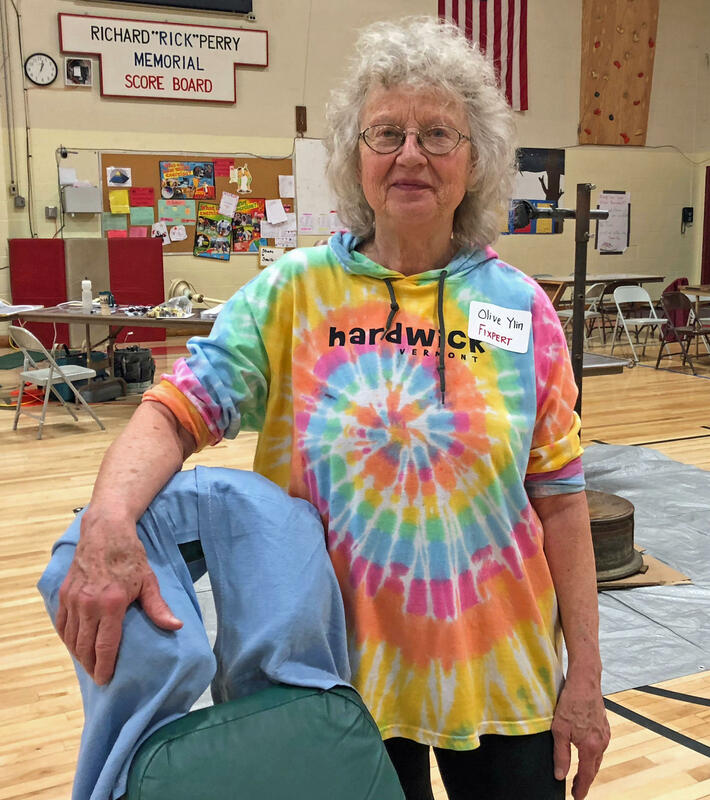 "Fixpert" George Sawyer, of South Woodbury, is a professional woodworker but offered up his overall handyman skills to the Hardwick Repair Café on Saturday, April 28. All sorts of handy people spent a recent Saturday in Hardwick volunteering to fix other peoples' broken stuff, and passing on a little of their know-how. 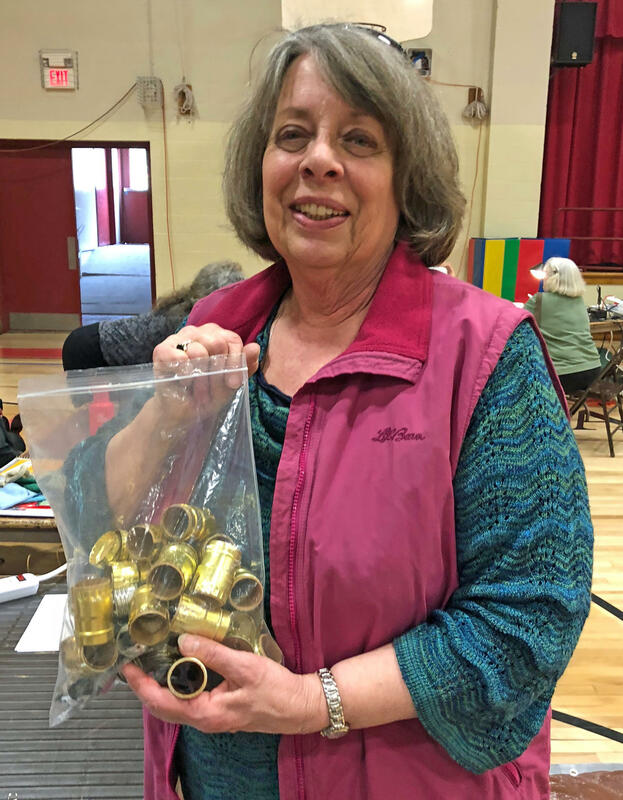 The Northeast Kingdom town was the site of the latest "Repair Café," hosted by the Central Vermont Solid Waste Management District and other sponsors. I brought with me an old cast iron floor lamp when I went to the Repair Café at Hardwick Elementary School. The lamp worked, but I was afraid to use it because the part that holds the lightbulb kept dropping down, exposing wires. Diana Peduzzi bought a lot of "new old stock" lamp fixture parts in an online auction and put some of them to use at the Repair Café. After my lamp and I were checked in, we were matched with a "fixpert" – a fixing expert. Well, actually it took two. George Sawyer, of South Woodbury, worked on the lamp, and Diana Peduzzi, who owns a lamp shade shop in Hardwick, donated a new part. 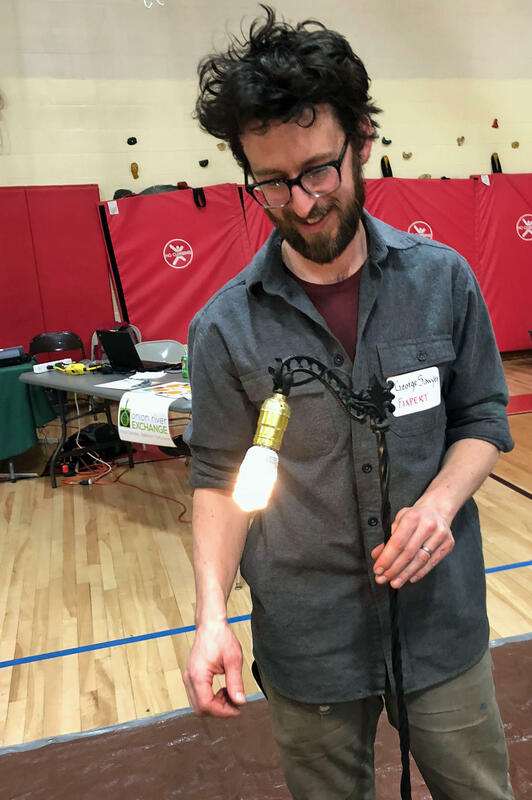 Central Vermont Solid Waste Management District Outreach Coordinator Charlotte Low said the event attracted people who can fix all kinds of things. "So we can fix electrical, mechanical issues," Low said. "We’ve got people who can sew. We even have a massage therapist here who can fix your neck or your headache." Paul Scheckel, of Calais, is another fixpert whose expertise is repairing appliances and small electronics. He said he came out "just to have fun, meet some interesting people and, you know, give back to the community and just share my skills." "Basically our mission is to keep as much as we can out of the landfill; there’s only one landfill in Vermont. And to educate people and empower people to fix things instead of disposing of them, 'cause we’re such a disposable society, in a way." Olive Yin, of Elmore, offered her massage therapy services to fix tight shoulders, stiff necks and headaches. The Hardwick event is the second of three Repair Cafés planned for this year. The next one will be held in Bradford. Low said Vermont’s first Repair Café was an event they held in Barre back in January. "It originally started in the Netherlands," Low explained, "and it’s happening all over Europe – Repair Café as [an] actual organization, which we registered and we’re a part of. And we’re the first on the map in the state of Vermont – woohoo! – which is really exciting. So, we’re happy to be pioneers in that way and we hope people will follow suit." The Central Vermont Solid Waste Management District is partnering with Onion River Exchange time bank to help coordinate the volunteers. And the exchange’s Eric Bachman says he wants to keep it going. "And we hope to find volunteers to continue this on for several, you know, months, years in advance," Bachman said. "Maybe once every quarter, once every two months. We’re looking for people who would like to continue this tradition, which we’re starting." It works! Between George Sawyer's skills and Diana Peduzzi's parts, my lamp was good as new in no time. Another sponsor of the Hardwick event was the Center for an Agricultural Economy. Bethany Dunbar, the organization's community programs manager, said the center got involved because it is interested in all sorts of ways to "make our community greener." "We are about sustainability," Dunbar said, "and so we started with compost but we’re also working together with Central Vermont on this because it’s about not throwing things in the trash." As for my lamp, Sawyer's and Peduzzi's combined efforts did the trick. It won’t be going to the landfill anytime soon. If you fancy yourself a Mr. or Ms. Fix-It, or maybe you're more of a "Need a Ms. Fix-It" kind of person, we've got a matchmaking event for you! The Central Vermont Solid Waste Management District, the Onion River Exchange and the Center for an Agricultural Economy are working together to host a Repair Cafe in Hardwick at the end of April. There’s been an upswing of student activism in 2018, from Black Lives Matter flags flying at schools to school walkouts against gun violence. Now there’s a group of Vermont students providing a soundtrack for those actions. Two Vermont companies have joined forces to encourage gardeners across the country to help fill their local food shelves. This time of year, many Vermonters are thinking about signing up for a CSA share at their local farm. Meanwhile, the Vermont Youth Conservation Corps is getting ready to supply a different type of Community Supported Agriculture – one you pick up at a doctor's office.